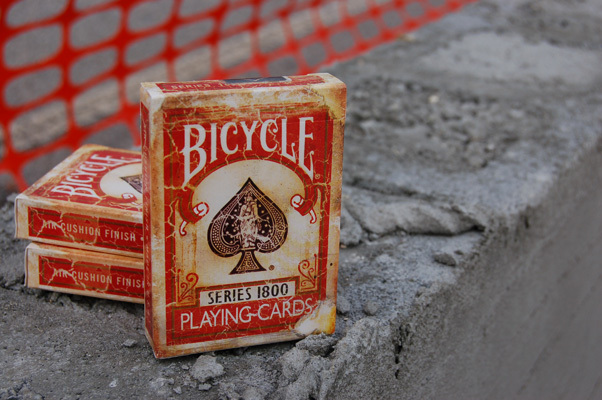 Discount Magic - Bicycle 1800 Vintage Playing Cards Red - Ellusionist. Ancient, worn and cracked. 1800's are ripped from history. Now available is Red or Blue deck.
" About half an hour ago, I received my brand new 1800 decks. I had no idea what to expect, as I tore open the package. Now there is packing peanuts all over my floor. I pulled out one deck, and just froze up. The DETAIL put in this entire deck is unparalleled, I mean even the seal is all burned up. You can't get any better than that. I was afraid to take the shrinkwrap off, because I was afraid I would break the box, but I had to keep telling myself it was a brand new deck. I pulled out the cards, and utter silence. My dad was like "How can you get so excited over a deck of cards?" I ribbon spread them on the counter, and he was like "OHHH That's why." This deck is so forceful, and there is not one white spot on it. The detail is insane, and I can not stress that enough. No one card is different, trust me, I looked three times. The scroll work on the cards is distressed, the pips are cracked, there are tea stains on the faces, and the coolest part, is the burned edges. It really stands out in a spread. The first thing I did when I pulled them out was a simple fan. They fanned better than ghosts, and then I knew this would be the only deck I would ever use. I've been handling them non-stop since I got them, and they are still brand new but still very old. They handle beautifully, spread perfect, and I can't say enough about them. Honestly, Ellusionist has outdone themselves again, and especially the artists that put the work into them. There was controversy about it being a thinner stock, but honestly, the finish makes up for that. The finish is one of a kind, and it feels like a 200 year old deck. You'll have to get it to see what I mean. The price is fairly cheap, and I will most definitely be picking up more of these. The cards are an illusion in themselves, because they may look very old, but they handle better than anything out there. You have to keep telling yourself, this is a new deck of cards. It is pretty trippy, which I why I love handling them. They say perfect 10's are reserved for real magic, well, the 1800 deck shatters that scale. It is like a 5000 out of 10. It is like nothing out there. This is, honestly, one of the BEST deck of cards EVER to hit the market. Black tigers wow these cards are excellent i have these .. Bicycle 1800 Vintage Playing Cards Red - Ellusionist Ancient, worn and cracked. 1800's are ripped from history. Now available is Red or Blue deck.